The center separator/spline provides the cable extra support to help fight against twists and kinks. It also separates the pairs to further eliminate crosstalk. Our cables are manufactured with 100% bare copper wire, NOT copper clad aluminum (CCA) wire. Please reference our trueCABLE spec sheet image for complete product information. HIGH PERFORMANCE DATA CABLE. 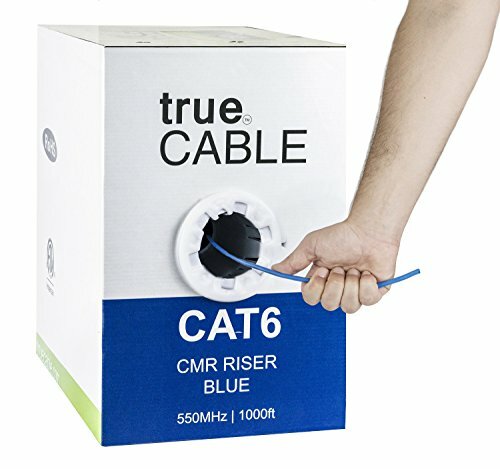 This riser rated cat6 ethernet cable is 23 AWG with 4 pairs (8C). Suitable for Fast, Gigabit, and 10-Gigabit Ethernet. Supports bandwidth of up to 550 MHz. HASSLE FREE PACKAGING. 1000 feet (305 meters) of our trueCABLE product has been packaged in a tangle free, easy pull box so you don't have to worry about getting behind on your next job. 100% SOLID BARE COPPER CONDUCTORS. Pure bare copper produces a stronger signal along with better conductivity and flexibility when compared to copper clad aluminum (CCA). FOR USE INDOORS. The blue riser rated jacket is for use in between floors and non-plenum spaces. ✓ FLUKE TESTED, CUSTOMER APPROVED. All category cables meet or exceed ANSI TIA/EIA 568-C.2 standards, are RoHS compliant, and ETL listed. If you have any questions about this product by trueCABLE, contact us by completing and submitting the form below. If you are looking for a specif part number, please include it with your message.